Baked bronzers and highlighters seem to always catch my eye, I'm a true makeup magpie when it comes to anything remotely shimmery or pearlescent. I adore highlighted cheekbones and a bronzed glow, I've tried many different textures to create the perfect highlight. Cream, powder and liquid have all been used and tested and whilst I have a tendency to go for powder it seems the baked variety works best and creates the best results for myself. I do like cream and liquid highlighters purely for the application, you can tap or pat away and get a precise application whereas using a powder and brush you sometimes don't get a perfected look. My latest makeup magpie addition to my baked highlighters are the Sue Moxely Baked Bronzers, these are labelled as bronzers but I've been using them otherwise. The packaging is nice and simple not fussy which is always pleasing in my eyes, inside you have a plastic protective cover and a handy sized brush. Normally whenever a product comes with an applicator I always try to use it and see if they are any good. Whilst I found this brush OK and have since used my e.l.f Blush Brush I wouldn't totally dicount it, if I was going to use this for highlighting then that's fine but I wouldn't say this is great for applying as a bronzer or a blush. The brush is wide but thin and great for dusting on the cheekbones. 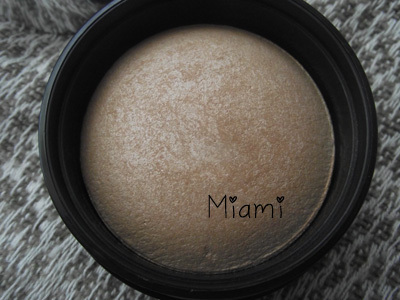 I actually use both of these totally different, Miami as you can see is a beautiful baked champagne and gives such a radiant glow. 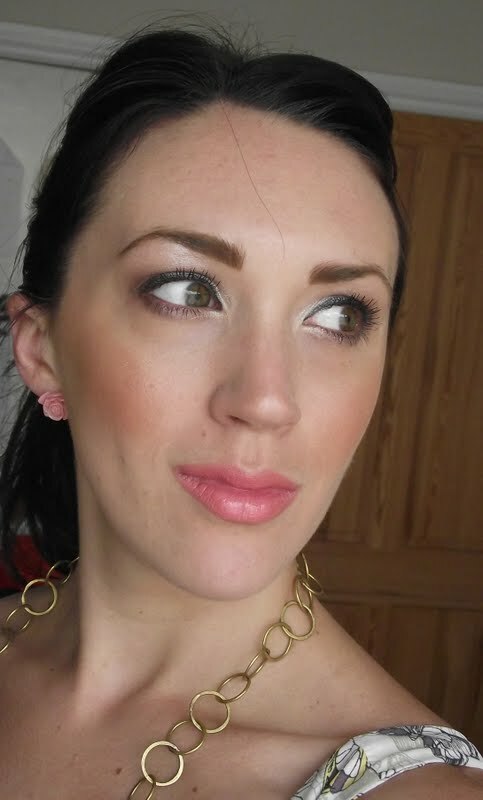 I have been wanting Macs Candlelight MSF for yonks now and sadly it was LE some many moons ago, but I feel I have found my own version and have used this numerous times over the tops of my blushers to give a really pretty highlight. 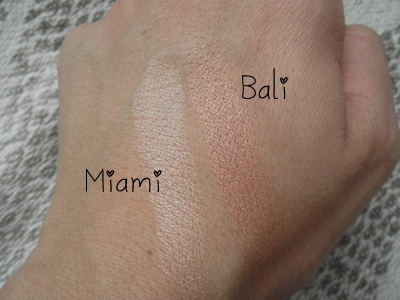 Here's some swatches but believe me when I say the swatches don't do these beautiful bronzers justice, you need to go see them for yourself. Bali has stunning gold veining in, which is so similar Macs Petticoat I think on first glances but I would need to swatch these together and photograph together *scribbles down future post*. 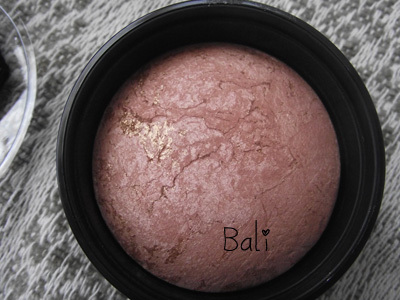 I know this is described as a baked bronzer but I've been using this as a blush, for me it is slightly pink to be a bronzer but would give you an all over glow if you where very light on the hand. In this photo I am wearing Bali on the cheeks and then Miami on top as a highlight. I'm going to do a post on this FOTD so watch out for it. You can purchase these from selected Superdrugs for only £6.00 I really recommend you try Miami. Thanks for reading my cherubs, I hope you're all having a super Sunday! Those are absolutely gorgeous! But ah! Alas, I cannot access them from the U.S!